food that looks so fascinating and weird that I absolutely MUST make it even though there’s a strong possibility I won’t love it. I don’t care how hard the recipe is. The dishes in Prune are fairly evenly spread between these four categories, which is rare. Most cookbooks have a lot of dishes in categories #2 and #3 and few, if any, in categories #1 and #4. Categories #1 and #4 are fellow travelers with vision, boldness, and arrogance, all qualities GH has in abundance. I should say here that category #4 has always been my favorite category. There are category #4 dishes that I've been wondering about for decades, like Marcella Hazan’s tonnarelli with cantaloupe. I put GH’s recipes for veal heart, tripe, tongue, et cetera, into category #1. Category #2 is larger than it should be. Maiale tonnato -- thinly sliced pork blanketed in tuna mayonnaise -- looks great, but GH directs you to braise the pork in octopus broth. Not happening. Likewise, a rice dish calls for duck stock and another dish for duck cracklings. Nope. Suckling pig is a nonstarter and I’m not asking the butcher to special order me pigeons. Also in category #2: banana bread. GH gives restaurant-scale pan measurements for the banana bread. So irritating and imperious. Screw that. I’ve made the spaghetti carbonara (good) twice and the dreamy kouign amann between five and ten times. The poached peach with toasted almond cream was fine. I wouldn’t make that one again. The burgers were great, but I probably won’t make them again either because you can do good burgers without GH's time-consuming, cheffy twists. The smoky eggplant was lovely, but the accompanying sesame flatbread didn’t work. There’s a bona fide error in the recipe (the "1 1/4 cups water" should be 1/4 cup water), but even after I adjusted for that: problems. Her pan bagnat -- a version of the classic Provencal tuna-tomato-olive sandwich -- is insanely good. I made it twice in September. Recipe at end of the post. More category #4 dishes I haven't made, but plan to: Fresh Jersey tomatoes dressed with melted French butter. Mastic fondant -- a mysterious blob of sweet white goo that you serve in a glass of ice water. Fried mascarpone with fennel sugar. Black licorice granita. Of the category #4 dishes I've actually cooked, most have been sensational. Braised lamb shoulder with lemons. Peaches on buttered toast. Strawberry milk. Bacon and marmalade sandwich on pumpernickel. Grape Nuts with vanilla ice cream and maple syrup. I blame that last dish for at least three pounds of weight gain in 2015. I don't think I got the salt-packed cold roast beef with bread crumb salsa quite right; I might have to try that again one of these years. 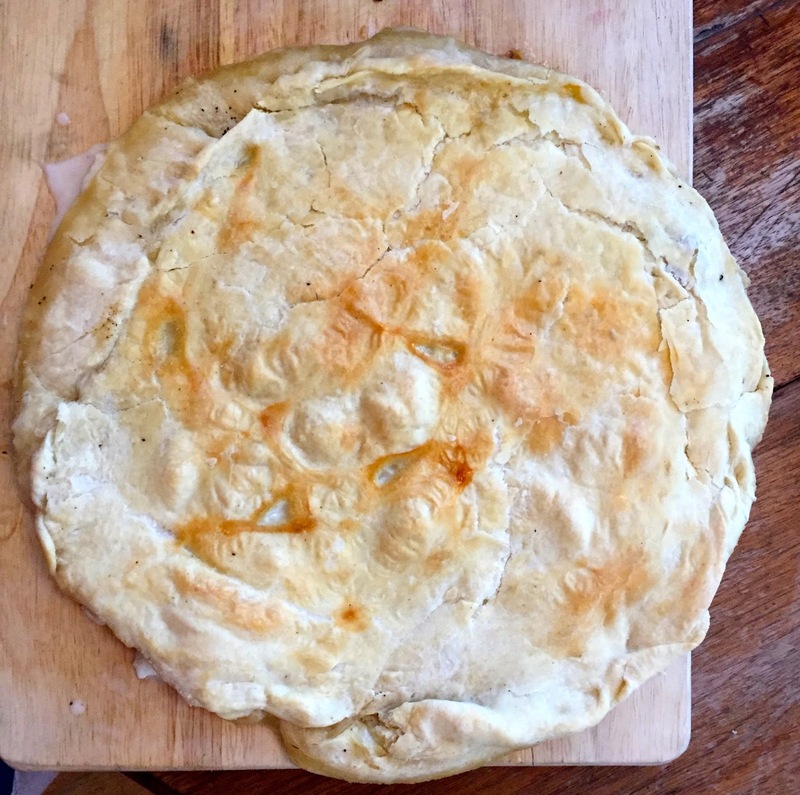 The slushy frozen milk punch was too sharply alcoholic to make again, but was definitely category #4, as was a short-dough pizza rustica that contains nothing but flour, egg, butter, mozzarella, salt, and pepper. How could that possibly be anything but bland? It couldn't be. It is bland. Buttery, cheesy, floury, white, and bland. I liked it the first time I made it, but not all that much. And yet as the months passed I kept thinking about it. I made it again last night and it was exactly as remembered and I was so happy. I love this dish. The right kind of floury, buttery bland can worm its way into your heart. I put the zucchini with green onions and poblano peppers in category #4 because I couldn’t imagine how poblano peppers (Mexican) would marry with a whole mess of sweet butter (French). The dish started to preoccupy me. The other night I made it and it was amazing. In conclusion, there is a lot of amazing in this cookbook. There is definitely some annoying, but there is more amazing. I have now told you about every single dish I have cooked from Prune. Two recipes for you. Banner day. Slice 1 1/2 pounds firm, smallish zucchini into 3/4 inch rounds. Slice 1/4 pound scallions (yes, that's a lot) into 1/4 inch rings, using all of the vegetable -- don’t stop when you get to the dark green part. Thinly slice 3 cloves garlic. Chop 1 poblano into 1/2-inch pieces. Melt 3 tablespoons unsalted butter in a dutch oven over moderate heat. Add scallions, poblano, and garlic, season with salt, and let sweat for a few minutes with the lid on. Add the zucchini, season again to taste, add 3 tablespoons unsalted butter. Stir to coat the zucchini with butter and let cook for a minute or two. Add 2 tablespoons unsalted butter and cover tightly. Cook 20-25 minutes until soft and almost falling apart. This needs to be served with bread to soak up the juices, which are delicious. As you have probably surmised, it is not a diet dish. Pan bagnat isn’t a diet dish either, but if you omit the bread and eat it as a salad, it works on almost every diet I can think of. I highly recommend trying it at least once with the bread. Lightly brush tuna with olive oil, season with salt and pepper, sear in a very hot cast-iron skillet until medium rare. (Or grill the tuna -- that’s what she says to do.) Use your hands and tear the tuna into 1- or 2-inch hunks and strips. Combine all the other ingredients except the bread and nestle the tuna hunks in the mixture. Season to taste with salt and pepper. Slice ciabatta rolls horizontally, hinging, without cutting all the way through. Set on a sheet pan. Fill with the tuna -- really heap it in there and make sure you use plenty of the liquid. (You’ll have extra tuna so you could make another sandwich or two, but the tuna is good the next day on its own.) Cover the sandwiches with some parchment and weight down in the refrigerator for a few hours with something heavy, like an unopened box of kosher salt. Flip after an hour if you remember. These are messy, wet, and absolutely great. Couldn't you try some of Category #2 with a variation that makes it doable -- like that pork and tuna mayonnaise dish but with a substitute for the octopus broth? This is an inspired post and I look forward to hearing how anything else from Prune works out. Still a bad name for a cookbook though, I think. Yes, you could use other broth, but I saw her do a segment of her tv show in which she uses the octopus broth and I would feel like my own maiale tonnato would be second rate. Also, she uses a meat slicer to slice the maiale and I realized my maiale would never be so thin and perfect. I love the name Prune! Love the name and love the dried fruit! I was just given some mastic from friends who were traveling in Greece and have been at a loss with what to do with it. I am not a huge fan of fondant but making it (as I had to do at culinary school) is a fascinating lesson in chemistry. Her serving suggestion is an interesting one. Gabrielle Hamilton really is an interesting figure. I read BBB and although I didn't particularly LIKE her, I found I liked the book and, somehow, her work. There is something about her and her cooking that I have to respect. Her uncompromising nature makes her difficult and seem arrogant, but it is that very thing that also makes her so compelling and her food so intriguing. Thanks, Maggie. Google "Greek spoon sweets" and then "vanilla submarine." The vanilla submarine has a mastic variation. You'll enjoy the pictures. Thank you, this was such a delicious pleasure. I agree with the Piglet comment above. But you're running a way more interesting version over here. I marked the recipes I'm going to try today. Thanks, Sara. I want to hear what you make. Thank goodness the library had Prune or the Amazon drone would be on its way....seriously, why aren't you judging the damn Piglet? Spam is one of those ingredients I'm surprised Gabrielle Hamilton hasn't found use for. I had not considered buying Prune until I read this post. Still not sure I will- though the bread heels and pan dripping salad has me interested. Reminds me of Jacques Pepin's roast chicken "salad" from Julia and Jacques Cooking at Home, which is darn tasty. And yes, The Piglet would benefit from your writing. You should get it at the library. The book isn't for everyone. I saw it yesterday at my library on the "in demand" shelf and it looked like it had gone through the wars. Falling apart. Thanks for this arduous review! It is much appreciated. I am still "conflicted" about Prune. It all seems a little too on the edge or exotic for me and my kitchen. But, that could change as my level of adventurousness changes depending on several factors I can't nail down. That pan dripping salad does sound very good. Conflicted is a fair response to Prune. It's definitely hard to find your way into it -- you have to make a bit more effort than usual. That pizza rustica looks exactly like the wonderfully bland khatchapuri they eat daily in Georgia (the formerly Russian one). That is an excellent place for culinary adventuring, also. I will have to try this recipe! Georgia. I bet the food there is interesting. I made that Marcella Hazan recipe years ago, with the same curiosity you had. My cookbook note: Very 80's! It was fine. Not a keeper. So I'm off the hook? Don't need to try it? I mentioned the cantaloupe pasta and then decided I had to go buy a cantaloupe, which is now sitting in the refrigerator. Maybe we'll just eat it plain. If it were bad I'd tell you - but it was fine and you want to try it. Give it a whack! I just love your blog and this long, informative, cut to the chase review of Prune is why. Can't wait to read more.